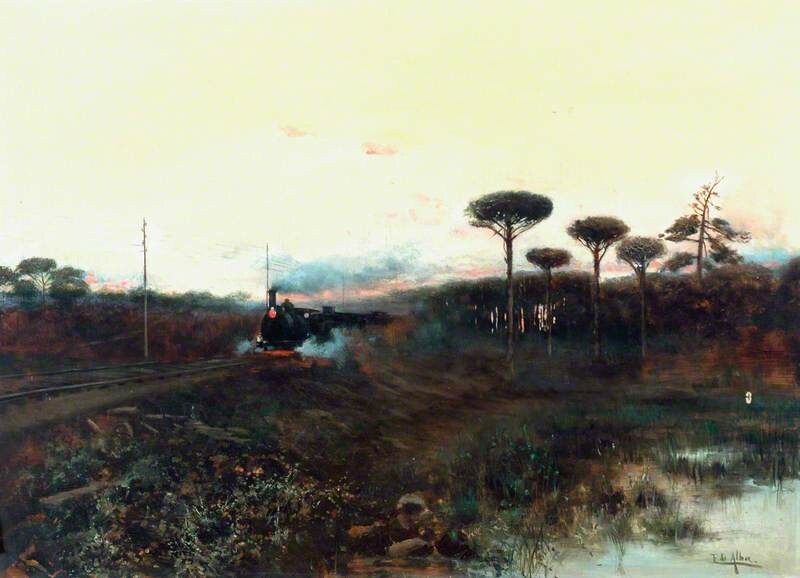 The National Rail Museum asked members of Art Detective if they could identify the location and type of train in ‘Train in Landscape with Cork Trees’. 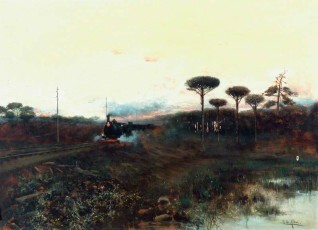 Andrew Greg started the discussion by saying that he could not comment on the type of train, but he felt that the trees in the painting were perhaps not cork trees, and looked more like pine trees or conifers. AM countered by saying that they found a photograph of similar trees in the Sierra de Aracenan region of Spain, on the Andalusian/Portuguese border. AM later thought they were tall trees with the shape of foliage cut to resemble a ‘vase’, found around the Rhode Mountains in Cape Town, South Africa. Mark Robinson doubted this and said that they are in fact ‘stone pines’ that are trimmed to protect them from regular fires on the slopes of Table Mountain. Andrew then referred back to the photograph provided by AM, and suggested that the trees look more like pines and are similar to those in the train painting. He then went on to discuss whether they are cork trees or holm oaks, and finally settled for Sylvester pines, due to their height compared to the utility poles that appear in the painting. Martin Hopkinson later suggested that they look like umbrella pines common in the Mediterranean, and could be from the Maremma region, or the Ebro Valley, North Eastern Spain. He finally settled the argument by identifying the trees as umbrella pines, found on the French side of the Western Pyreenes, at Guethray, near Biarritz and Bayonne. AM was the first to pick up on the type of train, indicating it looks like a ‘Tren de la Fresa’ (Strawberry Train), and backed this up with links to photographs. Louis Musgrove thought that the steam locomotive in the painting looked like a tank engine, similar to a Beattie 2-2-2. AM described the locomotive at length and its surroundings, whilst John Middleton noted that it resembled Spanish rolling stock with its elevated brakemans. Finally, Tim Williams confirmed that it is the ‘Tren de la Fresa’ (as AM pointed out), by the artist Eduardo de Alba. Since one of the artist’s paintings was sold at auction in Madrid, it suggests he was from that region. Al Brown provided further proof from a ULAN List with an Eduardo de Alba painting, and Tim Williams found evidence from Benizet about a painter from Madrid who died in 1900. 'Student Eduardo Pelayer, awarded distinctions at exhibitions in Madrid, 1895, 1897, 1899’. Editor’s note: This change will appear on the Your Paintings website by July 2015. Do you know what type of train is in 'Train in Landscape with Cork Trees'?